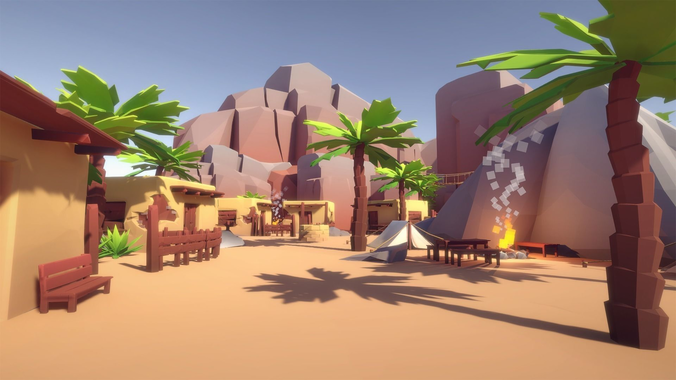 Build your own Desert or WildWest levels and landscapes with this asset pack! The pack contains a lot of assets: Plants, Rocks, Mountains, Sand Dunes, Buildings, Camps & Tents, Walls / Pallisades and much more. See the screenshots to get an impression of the vast environments you can build! Suitable for any rendering, game or engine, also AR / VR with performance in mind: Everything shares one material and one texture, so everything can be batched together in game engines. All assets come in FBX format, so you can use them in any 3D software and game engine. All pivots are correctly placed and all meshes are scaled accordingly with frozen transformations, so working with them is convenient. Screenshots taken from our Game in Unity3D, only the assets from this pack were used in the screenshots. Build your own desert world in no time!